So, it has taken me quite some time to get round to updating the world (hello, world) on the baking challenge – namely the penultimate challenge of series one, the little tea party cake. In the meantime, we’re inching ever-closer to the airing date of series four of the Great British Bake-Off, and there has been a run-up of media stories generated to whet our interest (or indeed appetite). The trailer is very dramatic but also kind of awesome. Exciting, but overwhelming to think that my little notebook will need to be padded out with more challenges. (She says, as if this isn’t entirely self-imposed and could be given up at any point if so wished). Anyway, I’ve finished my latest MA assignment, schlepped a hard copy from south-west London to Bloomsbury and verified my Turnitin receipt. I will not have to write something along the lines of “Historians and others […] may use patriarchy as the universalising context which cuts across all cultures and enables comparative analysis of women’s experiences by providing a common frame of reference for all women” for some time. Uhhhhhm, baking! The final episode for the first series of the Great British Bake-off adopted a two-stage runoff process, whereby only two bakers of the final three could go forward to the final based on the judging of their ‘semi final’ bake, a little cake, appropriate for a tea party.The first series of GBBO was the only one which adopted this format for the finale, with the others adopting the more typical ‘signature, technical, showstopper’ and final judging, and it was certainly controversial. Ed was a great baker and a worthy winner, but Paul’s rejection of Miranda’s offering seemed to be based on a personal dislike of cupcakes. “That’s a child’s cupcake,” he snapped at the pure-white, delicately decorated confection. He didn’t seem to think cupcakes appropriate for afternoon tea – although, even if they’re not part of the classic afternoon tea, it is now certainly normal to have cupcakes included at even very posh and elegant high teas. Like them or loathe their cutesiness and everything that goes with it, cupcakes are a modern baking classic. You can rail against their ubiquity, but I think it was unfair to mark someone down for it. 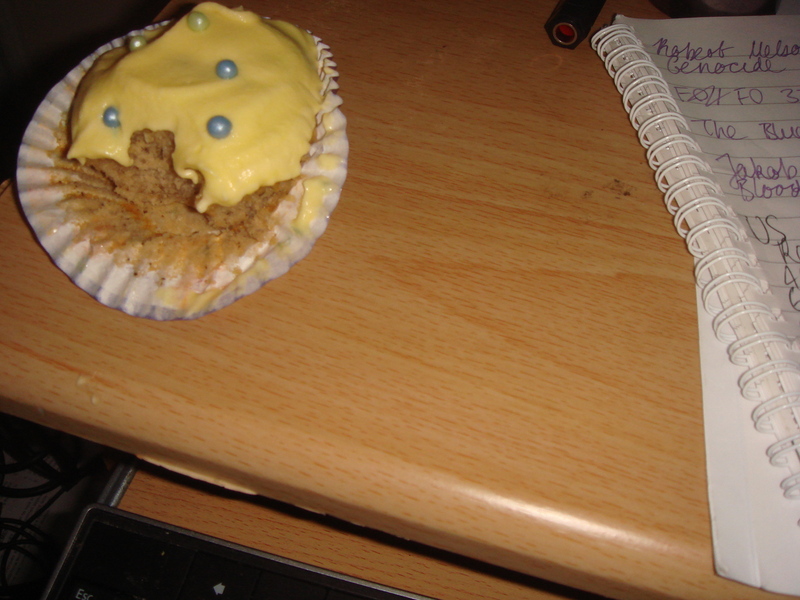 And Miranda’s cupcake was really gorgeous – I was glad Mary stuck up for her. I don’t have the patience or skill for that kind of decoration but it is beautiful. So, I made a cupcake – lavender Earl Grey cupcakes, a combination I’d not seen in a cupcake. I based the cupcake recipe on a Hummingbird recipe for Earl Grey cupcakes (sugar much reduced as the original used a LOT), which involved making a strong tea to flavour the cupcakes, mixing it in with dried lavender buds, but it was a very simple recipe to put together. I wanted to avoid making it too strong and soapy but actually the flavour was very subtle and I would recommend maybe doubling the tea and lavender if you want a definite taste. Perhaps controversially, I used half butter, half Trex for the fat. I love the rich, buttery taste pure butter brings, but I didn’t want it to overpower the quite delicate taste of the Earl Grey tea and lavender. The Trex also gave them a light, very fluffy structure that people commented on and which suited the nature of the flavourings. Lemon is a classic with Earl Grey tea and so a gently flavoured, not overly acidic lemon Swiss meringue buttercream was a good match. The acidity of pure lemon juice can split a Swiss meringue buttercream so I swirled through some very tart, almost fatless lemon curd and a little lemon extract. It carried the flavour well and there was enough to generously frost the cupcakes with a palette knife – it was a bit too liquid, what with the addition of the curd, to pipe. 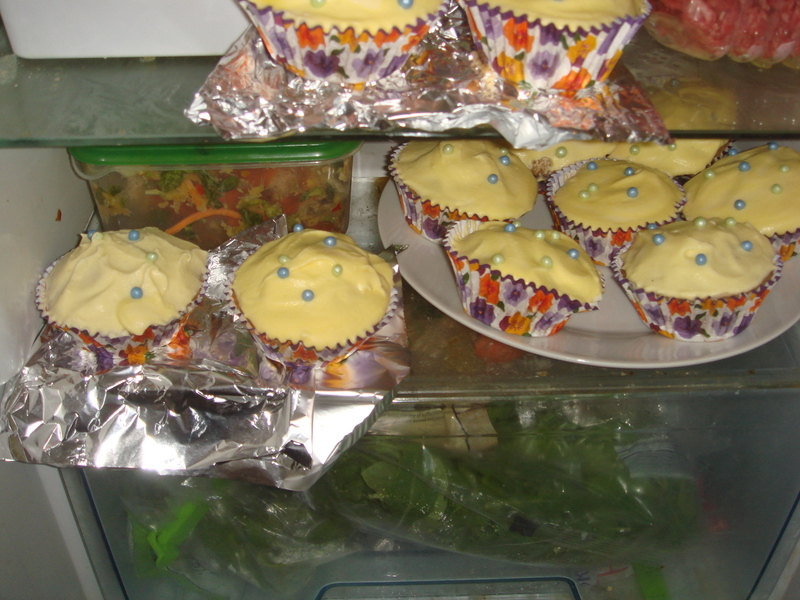 I decorated them with blue and green sugar dragees – they looked and taste sweetly ladylike but not, I think, too twee – then took the cupcakes in to work. Note: the Tube is not kind to cupcakes. By the end of the journey the cupcakes had somersaulted, icing was smeared everywhere, the dragees had rolled off and some cakes were even broken. Shame, but I fixed them up with a teaspoon and they were still eaten. All power to the cake. It looks like there’s a lot to do but it all comes together quite simply. Adapted from a Hummingbird Bakery recipe. Makes 12-16 cupcakes. Preheat the oven to 190C and line a muffin tin with paper cases (about 12-14). Mix together the butter, sugar, flour, baking powder and salt using a hand-held electric whisk or freestanding mixer until the texture of fine breadcrumbs. Whisk the milk and eggs together. Strain the brewed tea through a fine-mesh strainer, pressing down to extract all the flavour and add to the mixture. Pour three-quarters of the milk mixture into the dry ingredients and mix on a low speed to combine. Scrape down the bowl, add the remaining milk mixture and beat until all the batter is smooth and the ingredients fully combined. Divide the mixture between the cases, filling each two-thirds full. You may need to prepare extra cases. Bake 18-20 minutes or until risen and springy. A cake-tester should come out clean. Let cool a couple of minutes in the tin before transferring to a wire rack to cool completely. They must be completely cool before frosting with the Swiss meringue buttercream. Once you’ve made the frosting, which you can get on with while baking and cooling the cupcakes, swirl it on with a palette knife and decorate as you wish. Combine sugar, lemon juice and lemon zest in a (very) small saucepan over medium heat. Stir until sugar is dissolved. Cook, stirring constantly, on a low heat, until the curd just comes to a boil. Remove from the heat immediately and let cool completely before swirling through the frosting. Combine sugar, egg whites and salt in a heatproof bowl. Place over a pan of simmering water. The bowl should not be touching the water, and should not be immersed in it, but just be resting over it). Cube by cube, add the butter, mixing well after each addition.Once all the butter has been added, beat on low for a few more minutes. Add the lemon extract or oil – you may want to do this bit by bit, beating it in each time and tasting as you go. If you want to add the food colouring, you can do that here, too. Scrape down the bowl and beat for a few more minutes until the buttercream is completely smooth. Fold through the tart lemon curd and mix until thoroughly combined. Adjust the food colouring if you wish.